Even among the organized and controlled environment of special collections and archives hidden gems and buried treasures await discovery. This exhibit highlights some wonderful finds from newly donated and recently processed collections. Materials on view include a selection of rare books from the Robert Campbell Jr. Collection, the King James Bible from the John McClintock Collection, politically-centered material from Richard L. Walker, U.S. Ambassador to Korea, the letters and works of famous people from the Historical Manuscripts Collection, captivating magazines from the David Johnson Science Fiction Collection, and powerful and haunting examples from the Drew Center for Holocaust/Genocide Study Collections. 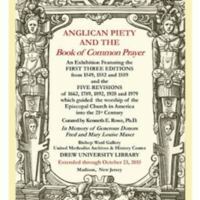 This exhibition of the four hundred year old Book of Common Prayer and its progeny showcases a book that is not only used for public worship and private prayer but, by its liturgical excellence, holds a special place in the evolution of English language and literature. Archbishop Cranmer’s somberly magnificent prose, read week by week, entered and possessed the minds of many English-speaking Christians and became the fabric of their prayer, the utterance of their most solemn and their most vulnerable moments. 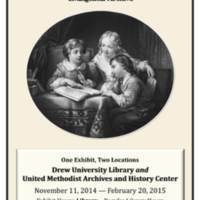 Drawing on Drew’s rich holdings in nineteenth-century evangelicalism, the exhibit spotlights novels by Rev. E.P. Roe, a Presbyterian pastor who left the pulpit to sell his bestselling novels, and highlights religious periodicals such as The Advance, which published fictions by such authors as Elizabeth Prentiss and Charles Sheldon. The exhibit also examines the ways various subgroups within evangelicalism crafted their own literary identities, for example, in the publications of the African Methodist Episcopal Church, and highlights the complex relationship between evangelical children and evangelical fiction in such texts as the Children’s Tract Series of the Methodist Episcopal Church. 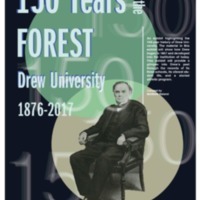 Drew University is fortunate to be the home of over two dozen books printed in the fifteenth century and dozens more printed in London during Shakespeare’s lifetime. These were likely bought and sold in the lively book trade centered on St. Paul’s churchyard where the First Folio was also available for sale. Several of these books, including two in our exhibit, were printed by Shakespeare’s childhood friend and London neighbor, Richard Field. Our exhibit explores the world of 16th- and 17th-century London book trade and how the ideas in circulation may have influenced Shakespeare’s plays. 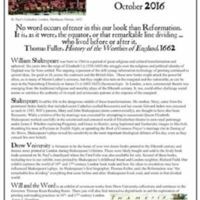 As Shakespeare’s first biographer, Thomas Fuller, said, the Reformation was “the remarkable line dividing” everything that came before and after. Shakespeare lived, read, and wrote in that divided world. Will and the Word is an exhibit of fifteen works from Drew University presented in the Thomas H. Kean Reading Room of the Rose Library. When Henry Clay Folger began collecting Shakespeare, it was considered bad form to collect more than one copy of a book. However, Folger collected 82 copies of the First Folio. While others discarded their duplicate copies, Folger and his wife Emily understood that each book was unique. Each copy of the First Folio has small changes and details that differentiate it from the other copies in the edition. The book’s provenance, or history, adds to the uniqueness of each copy. Previous owners wrote in the margins, rebound the books, or lost pages. 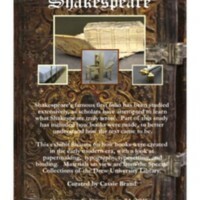 The ways in which books were made in Shakespeare’s time also creates many differences between copies, which are noted throughout the exhibit. This display of rare materials from the Drew University Library investigates synergies betweenen print and theatre history, creating connections between the First Folio! The Book that Gave Us Shakespeare exhibition at Drew and the Shakespeare Theatre of New Jersey’s concurrent performance of Richard III. 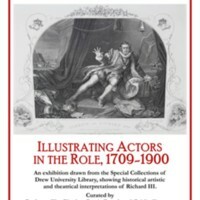 The Drew library collection primarily includes editions of Shakespeare’s plays printed after 1800, most notably a three volume illustrated set published by John Tallis and Company in London in 1850, an illustration from which is shown on the poster for this exhibition. While these books mark the rich afterlife of Shakespeare and his plays in print and performance, they also demonstrate the continuing interchange between the two modes of presenting the plays that began during Shakespeare’s lifetime. 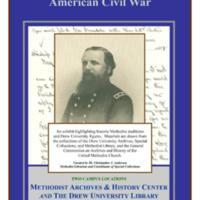 Drew University, founded shortly after the conflict, had several direct connections to the Civil War. Drew landowners, trustees, administration, faculty and students participated in the conflict. Those links are highlighted and the exhibit also showcases the historic tensions within American Methodism over racial identities that led to denominational fracturing and ultimately to sectional conflict. 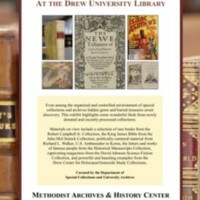 The exhibition highlights ten historic Methodist traditions and includes manuscripts, photographs, printed texts and material objects from the collections of the Drew University Archives, Special Collections and Methodist Library. Additional items on display include materials from the General Commission on Archives and History for The United Methodist Church. 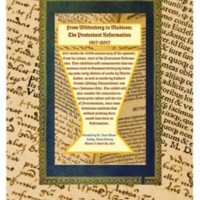 This exhibit celebrates both the “birth” of Protestantism and the role that printing played in its genesis and growth. Just as Reformers focused on the Word, this exhibit focuses on the word, on texts and on the impact of literacy. Displayed here are examples of the Humanist and Protestant concern with language (Erasmus, Melanchthon, and Beza), of Protestant pamphlet literature (Luther), of Protestant developments beyond Luther himself (Calvin, the Book of Common Prayer, Quakers, and Wesley), of Catholic opposition to the Reformation (Eck, Index of Prohibited Books), and of Protestant historiography (Flaccius). With apologies to Luther and other Reformers, we encourage you to indulge yourself in these remarkable materials from Drew’s Special Collections. Richard Walker, a Drew University graduate (BA, 1944), was an international scholar, educator, leader in international studies, and Ambassador to South Korea. 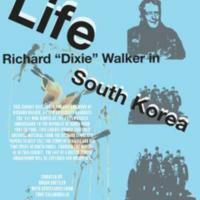 Serving in that position from 1981-1986, Walker’s tenure was the longest of any Korean Ambassador in U.S. history. This exhibition uncovers Walker’s life and experiences as ambassador. Along with his wife, Ceny, Walker made a significant impact on Korean-American relations in the 1980s and beyond. This exhibit celebrates Walker’s life and his longstanding role as an expert in foreign relations and Asian studies.